Barcelona is an amazing city with a whole lot of interesting sights and attractions. In addition the city has a very interesting history, and lots of cool stories which you will only get to know if you go on a guided tour. But, why jump on a crowded bus packed with people, when you can get on a private guided tour where your guide listens to you, your needs and your questions, and you can get the most out of your time and your money? There are tours done using car, while other tours are made on foot. Some happens in the centre of Barcelona, while other trips are made to the countryside. 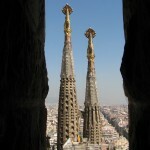 There are trips focusing on Barcelona and Gaudi, while other tours focus on for example Barcelona and Picasso! If this sounds interesting and you would like more information about different guided tours, go visit Viator.com. Want to read about other tours and programs in Barcelona? Read one of the following articles which might be of interest to you.